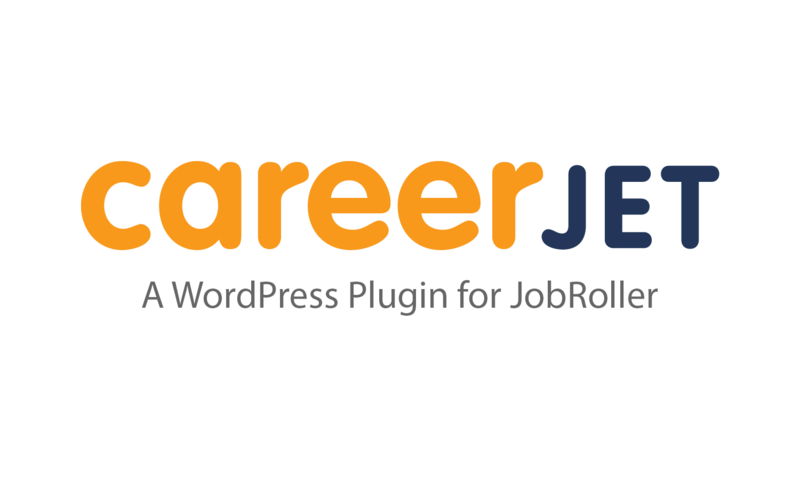 A highly customizable aggregator that pulls job listings directly from the Careerjet database (using their partner API) and loads them into your JobRoller website. This allows you to dynamically display jobs and monetize your listings whenever a payable job listing link has been clicked thru. Think about the potential! Works standalone or a way to supplement your existing job listing (or any type) of website. A free partner account with Careerjt. Make sure you’re approved before you purchase this plugin. Use ‘wp_remote_get()’ instead of ‘file_get_contents()’. Fixes issue when `allow_url_fopen` directive disabled in the php configuration. Fixed issue when plugin options have no effect in front-end. It does the job – good plugin to have. Hello there! I have some questions re: this plugin. 1. 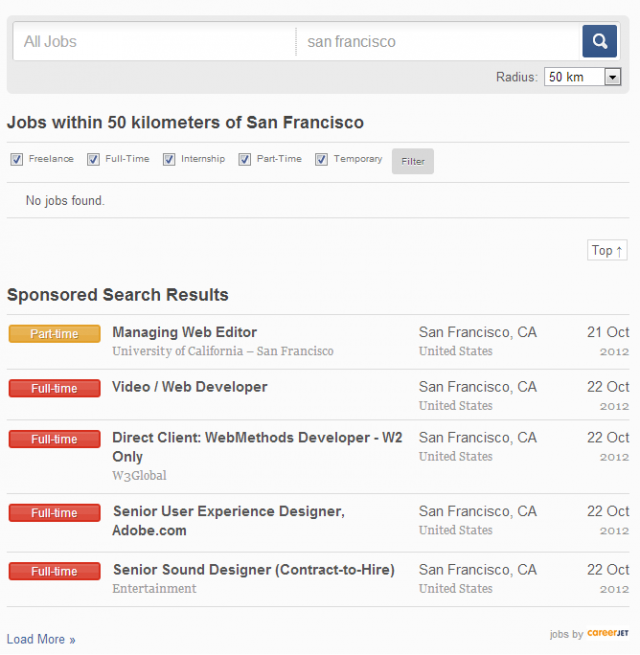 Could we load ALL jobs to our site and not just niches? 2. How many jobs would that be in total? 3. Will our jobs board show them as coming from them or can their branding be hidden? And to be clear, Indeed integration is built into Jobroller? No separate plugin for that? 1. You still need to specify queries for types of jobs to be pulled, but you can essentially set it up for whatever jobs you want it to pull. 2. This is determined by you. 3. There is branding to show where the jobs are fed from and the jobs are dynamically displayed on your site, so when the customer clicks the actual job it will go back to the source site. Correct, Indeed integration is built into JobRoller and does not require an additional plugin. Thanks. Quick question. When using CareerJet, will my users be directed to an external website when they find a job that they would like to apply to, or would my users be able to apply for CareerJet jobs on my website? To give an example, the Indeed feed takes users to an external site completely. is the same method used for CJ? @starahj, sorry to have missed your question earlier. Yes the method is the same as the Indeed.com feed. The jobs are dynamically displayed on your site, so when they actually click the link to the job they are directed to the actual careerjet site. Thanks. Is it works for Turkish? @Fatih Kaptan, Careerjet does appear to have Turkey as a supported country http://www.careerjet.com.tr/ Thanks. Hope you are very well! My site (jobroller) will be in Spanish and will cover several Spanish speaking countries. Can I use your plugin to populate my website with jobs from several countries? Will each country have its own feed? @teacdan, you can only pull jobs from one country. for our site http://www.swissmedicom.com , we need this plugin, can we post jobs from creerjet in german language? Yes. Careerjet allows pulling jobs from Germany. I have child theme JobApps, is it compatible? As I cann see I can filter jobs for type of jobs…But I wanna know If I can filter jobs so that are not displayed from certain URLs. For example, I dont want to show on my website all jobs from url http://www.test.com? @ntojsi21, please ask this question directly to the child theme author. It should be compatible but I suggest confirming with the author, first. @Bruno Carreço – What about the second part of my question? @ntojsi21, no, that’s not possible. Is it compatible with latest jobroller version? is it possible to display the few lines to job description as well? Yes. It’s compatible with the latest version. The Careerjet job feed does provide job descriptions but they are only small excerpts so, JobRoller does not display them. 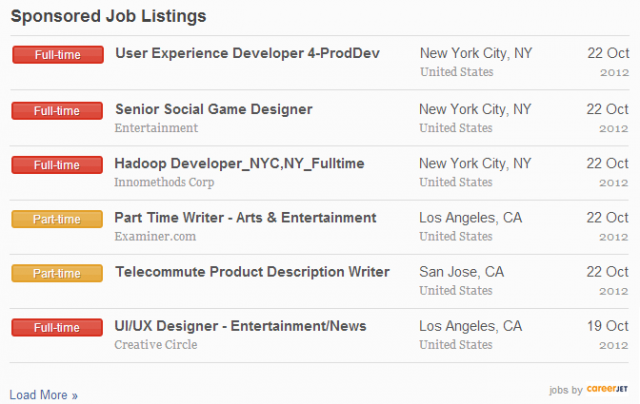 To display this job descriptions you would need to make custom changes. Do you have any demo site? @skader, there’s no demo site available. If you’re familiar with the bundled Indeed integration, Careerjet works in similar fashion. Can you choose which jobs are displayed based on location? I plan to narrow my site down to a more local base and don’t want to be showing jobs that are 100 miles away. @hyperion, yes, you can narrow jobs by location, postal code or city. 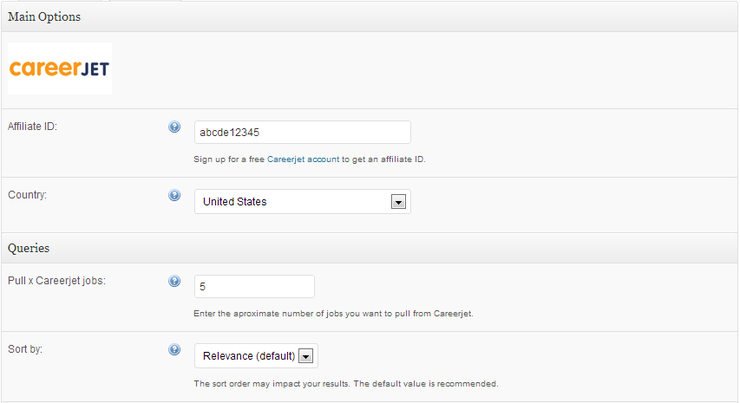 careerjet showing wrong country on search…it is showing the default country always. I searched on the forum as well. Can you please help me out. @makep, can you please post the issue on the dedicated support forum? The support team will be able to help you there. Thanks. Before I buy is South Africa included in your plugin in list of countries? Thank you. Yes, @stunaz. South Africa is one of the included countries. @rykardopedro, please note that job results will always depend on the availability of the jobs you want to display on the Careerjet jobs feed. Specially if you’re looking to display niche jobs. 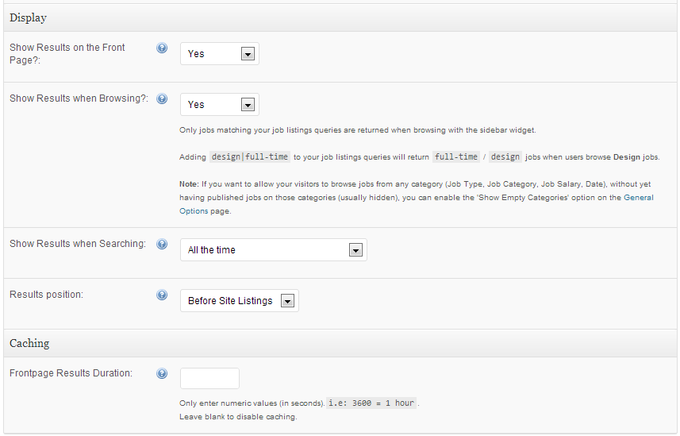 You can also configure the number of jobs that are displayed at a given time (depending on available jobs) on the plugin settings page. If you have any support questions or need help with the plugin please use the support forum (http://forums.appthemes.com/careerjet-publisher/). Our support team will be happy to help you. Hi all, I have downloaded and activated the Careerjet plugin as part of my Club membership but cannot see any related widgets to get it working and the install guide has nothing on this unless I am reading the wrong doc. Please help. Ok quick update. I have found out how to activate it but results do not automatically show on the home page unless I search. I cannot quite see where to post retrieved jobs elsewhere either. Thanks in advance. @appological, please make sure you have the option ‘Show Results on the Front Page?’ under the ‘Display’ group set to ‘Yes’. 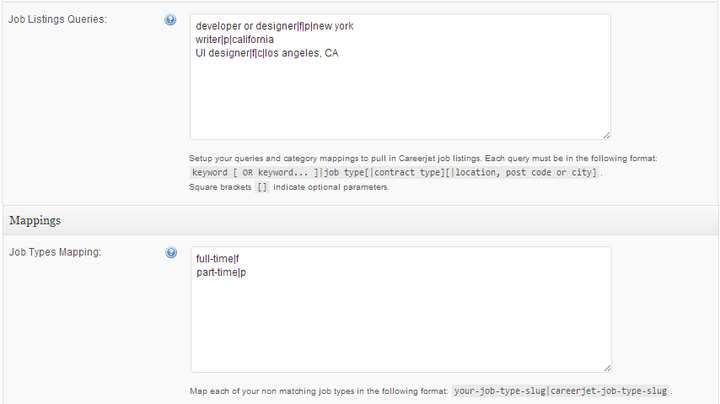 Hi Bruno, I had set this to YES but can only see jobs if I search and not automatically or dynamically. Thanks. @appological, are you using a 3d party child theme? In case you are, please try using one of the default themes. If the problem persists please use the dedicated forum thread (http://forums.appthemes.com/careerjet-publisher/) so we can further assist you. The plugin is excellent, but my translation does not translate to Portuguese, already tried anyway, it seems that it needs an update and only the responsible of the pluguin can provide, I have tried to contact several times but never respond. @empregocertomg, did you post your question in our support forum? If so, please include the link here so we can respond. Thx. How do I start a job transfer after you activate the add-on? Is this plugin worth buying? Is is still up-to-date and functional? Hi @Frank, this plugin is up to date and functional. It is up to you whether or not the plugin would work for your needs. Replace Google Maps with MapQuest on your AppThemes website.